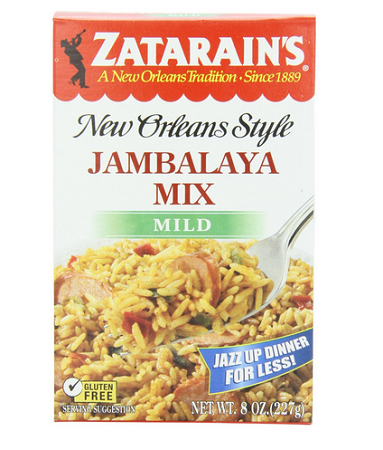 Zatarain's Mild Jambalaya offers the flavor and soul of New Orleans with less heat for the entire family. A New Orleans tradition since 1889. 15% more than leading rice mix product. This easy-to-prepare dinner mix has just the right blend of ingredients for a great tasting, authentic New Orleans style meal. Zatarain's has been the leader in authentic New Orleans style food since 1889. So when you want great flavor, jazz it up with Zatarain's! Pinch pennies, not flavor. Zatarain's rice mixes are an affordable way to make authentic New Orleans style meals. Simply add meat, and you have a delicious New Orleans meal that won't break the bank. This is an 8oz box.